hungry and scared, in need of homes. children fleeing conflict and persecution now. but with courage of words and fearless feet. 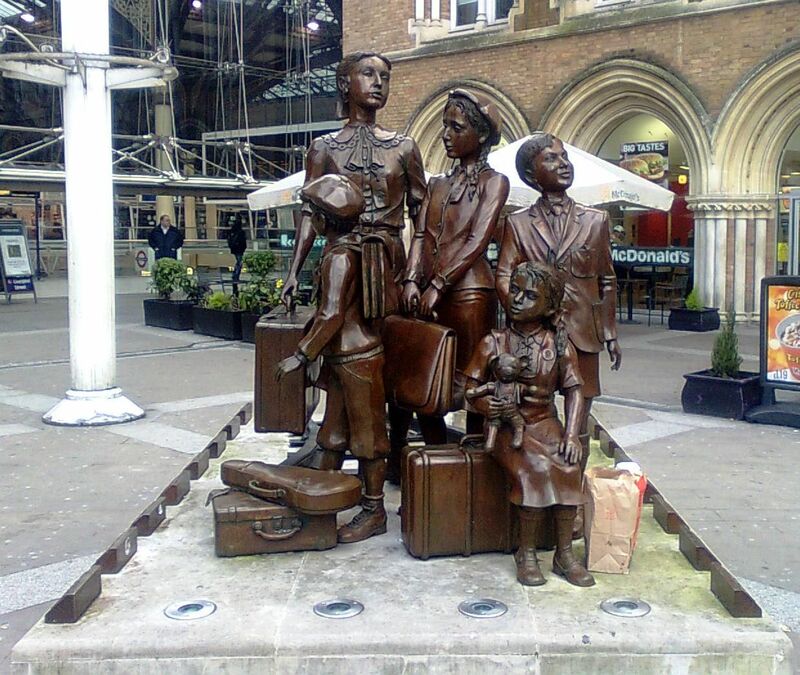 Kindertransport statue at Liverpool Street Station (found on Pinterest). I stop at this statue almost every time I get the train to London. Sherry is back this week with Wordy Thursday and she reminds us, with words and images, of the plight of child refugees, particularly those arriving desperate and exhausted at closed Mexican-U.S. borders. She writes of patriarchy, social injustice and environmental disaster. She also reminds us that women are doing all they can: they are being elected in the midterms in the U.S. and marching in protest, to make us and to encourage us to support the thousands of children at the border. Whether we march or don’t march, we can join our voices to those working hard to birth a better world, so Sherry asks us to write a poem of social commentary in free verse or form contemplating these issues, whether an elegy of sorrow for the children or a paean of tattered hope for all that needs saving. I have written a poem using some of the words found in an article written for The Independent newspaper by Yvette Cooper, the Labour MP for Normanton, Pontefract and Castleford. Posted in Poems. Tagged dverse Poets Pub, Imaginary Garden with Real Toads, Kindertransport, Open Link Night, Refugees, What we save saves us, Wordy Thursday with Wild Woman, Yvette Cooper. I heard a story on the radio about a month ago, a man and his father were telling the story of his father who was part of the Kindertransport–but to Sweden. The son never knew the details, as the father never talked about it, and his own parents were killed. The story mentioned the couple who sheltered the father in Sweden, and also the couple who had helped his family in Germany–heroes. Thank you, Merril. There are many stories like this. We need to revisit humanity. “children fleeing conflict and persecution now.”…The word ‘now’ puts whole humanity to shame. Even ‘now’? Hope good sense prevails everywhere and all misery comes to an end. A very poignant write, Kim. So well put. Have we forgotten these words? Have they been removed in the night? Makes me wonder if Trump has even read it? Might be a bit too advanced for him. Your poem is so beautiful, Kim, and the Liverpool statue is wonderful. Thank heaven there are always good people who help in these situations. I only wish they were allowed in to the children’s camps at the southern border to comfort those crying children. How strange to have children’s camps, in North America. Thanks for writing to this prompt. Thank you, Sherry. The statue is at Liverpool Street Station in London, where all the Kindertransport children arrived from the south coast. My great uncle was one of the first to arrive at Bergen-Belsen and was horrified by what he found. He committed suicide when he arrived home after the war. I have such a heavy heart about the situation at the moment and I fear it’s going to get worse. We need some strong, brave, intelligent people to stand up to that idiotic dictator before it’s too late. What’s wrong with the people around him? Why aren’t they doing something? That statue! Your alchemic words, dot to dot making the connections visible! Beautifully done. Great poem Kim. I love your work. Brilliant contribution to social justice, Kim. Please forgive me. as I need to wipe away tears, from my eyes, Kim. Under Nazi occupation, my oma and opa placed their lives and those of their children, in helping the underground movement. Simple but deadly acts of hiding extra food and other things to help the cause. It’s a period that not many of my uncles and aunts talk. May we advance to the point that such act of social justice aren’t needed. Guess, you can call me, a dreamer, in hoping for this. But we have start somewhere. Not a dreamer, a hopeful human, Therisa. “There’s another page of history to turn and complete,”… sigh we live in hope. May peace prevail and misery come to an end. Amen. I feel for those child and adults refugees fleeing and seeking a better life. A relevant theme to write about Kim, thanks. It makes our Brexit dilemma seem a little less important at the moment, but we could be heading towards a similar situation if we don’t do something about it soon. Such touching words. The careless disregard of the immigrants at the border and the government workers without pay leaves me with such a heavy heart. How did it all come to this? I think we know the answer, Bev. The dilemma of refugee children is a heart wrenching one. There are no easy answers to the situations at hand.. and it appears there is not desire to compromise on either side of the issue. Great photo of the immigrants. Human beings as a group seem to never learn. I think it was George Satayana who said “Those who fail to learn history are doomed to repeat it? Sadly we are quite adept at that! Home is so vital for children — the sense of it, its welcome, the security of its enclosure — to be afoot and unsure of where that home might lie is a deep and life-long insecurity. Lady Liberty welcoming the emigrants in New York harbor is a far cry from the racial concrete fist of refusal Trump wants to build for his resentful shrinking fold. Here’s to “courage of words” INEXTRICABLY laced in “fearless feet”! Thanks for reading and commenting, Brendan. I really like the way you have shown us how cyclical history is. Refuges are a big part of global conflict, and no nation knows when it might be next to seek sanctuary. Thanks Kerry. It could be any of us, the way things are going. Somehow the Kindertransport seems like a particularly apt metaphor for the migrant caravan mess now. The oldest German child in the Kindertransport was almost excluded as being too old, then sneaked in at the last minute as being a brilliant scientist. He grew up and became a successful scientist in Boston, always mourning the untimely death of a favorite cousin who was absolutely too old to be rescued in the Kindertransport. Only in the present century did a PBS documentary show him that his favorite cousin was still living in London, and in fact, while mourning for each other’s death, the two teenagers had been living within a mile of each other. So much exploitation, and abuse, and outright lies, have been perpetrated by people seeking control over others…each one convinced that his (it’s very rarely “her”) end justifies such evil means. Thank you for reading, Priscilla, and for your comments, especially the details about the two cousins who were separated in the Kindertransport. I can’t believe we have American concentration camps for children now kids living in tents in the Galveston area. Thank you for giving them a voice. Thank you for reading and commenting, Christine. I’m thankful both for those who have the courage to start over in a strange land, and for those who welcome them. Thank you for the reblog, Nan! Well done, Kim. Thank you for sharing that statue. It is incredible, and I have never seen it.